Contact Our Repair Experts Before A Breakdown! Although they’re tough and durable, garage door springs are only designed to last for a limited period of time. When they begin to weaken and start to wear out, they need to be replaced as quickly as possible, in order to avoid the risky scenario in which they end up breaking. Even if that has yet to happen, spring replacement isn't something an amateur should try to perform. These units can be incredibly dangerous, so your far better off letting our technicians handle things. Springs have to haul a 150+ pound door up and down every day, year after year. Obviously, this type of stress starts to accumulate eventually, so it’s no surprise that they’ll wear out over time and eventually break. However, it is possible to reduce the amount of wear these springs are put under by regularly lubricating them and adjusting their tension as needed. This will help the door move more smoothly and silently, and will also keep it balanced, which will reduce some of the strain the springs are under. When your garage door springs are starting to wear out, they usually give off some warning signs. Watch out for a wobbling or sagging door; this is a key indicator that your a new set of springs may be needed, or at least some tension adjustment. You should regularly test your door’s balance, too, which you can do by disconnecting the opener and then opening it halfway. If the door can't stay in place then the springs have weakened and need to be tightened. Our technicians can advise you on whether they will need to be replaced or not. Never try to replace your springs without the help of our technicians. It can be extremely dangerous to do so, as these components are under a great amount of tension. Our team will safely secure your door in position before disconnecting and replacing the worn springs. We’ll then adjust the tension of the new units, ensuring that the door is properly balanced and that it can open and close. We’re always ready to help local homeowners with any spring related problems they experience. Contact Garage Door Repair Cedar Park today and let us make sure these crucial components are working safely and smoothly. 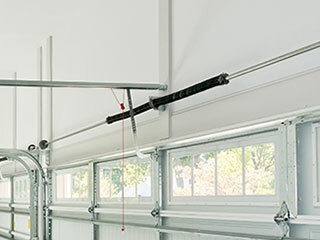 Although a lot of things can go wrong with your garage door system, our experts can fix them all. We also provide installation services as well as scheduled maintenance appointments. If you're looking for a new opener, or you need to have any hardware part replaced, use our online system to book an appointment with our technicians. Our technician will contact you before arriving. Until then, feel free to browse our website! Garage Door Repair Cedar Park is at your service!